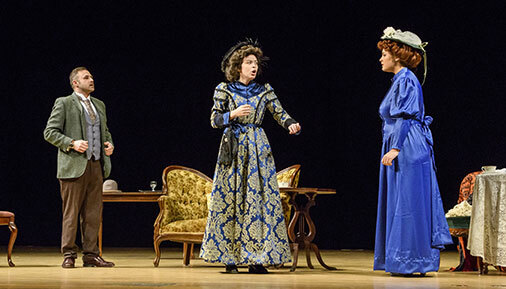 "The Importance of Being Earnest," Oscar Wilde's witty and buoyant comedy of manners that has delighted countless audiences since its London debut in 1895, is the year-end Theatre Arts Program production at Hudson Valley Community College. Free performances are Thursday, Friday and Saturday, April 19, 20 and 21 at 7:30 p.m. in the Maureen Stapleton Theatre on the Troy campus. The play is directed by Rosanne Raneri, associate professor, with students Conor Browne and Sarah Gary, assistant directors; Drew Gates, stage manager, and Jennifer Avila, assistant stage manager. The cast, also all students, is Colin Bauer as Lane, Robert Epps as Algernon Moncrieff, Ahment Vargonen as Jack Worthing, Jewel Winant as Lady Bracknell, Kaitlyn Baswell as Gwendolen Fairfax, Abby Koniszewski as Cecily Cardew, Dorothy Lynch as Miss Prism, Alex Zehner as Reverend Chasuble and Scott Brown as Merriman. "The Importance of Being Earnest," considered Wilde's most brilliant tour de force, is celebrated not only for the lighthearted ingenuity of its plot, but for its inspired dialogue, rich with scintillating epigrams. From the play's effervescent beginnings in Algernon Moncrieff's flat to its hilarious conclusion in the drawing room of Jack Worthing's country house, this comic masterpiece keeps audiences anticipating fresh plot twists from moment to moment. For more information, please contact the college's Office of Communications and Marketing at (518) 629-8071.